Last night catcher Gerald Laird was sent to the Detroit Tigers for two prospects believed to be RHP Guillermo Moscoso and RHP Carlos Melo. This is definitely not the trade I was expecting to see. 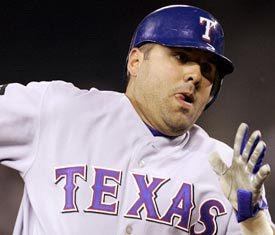 Gerald Laird has yet to establish his real level in the majors. He has shown fantastic offensive potential as well as being very inconsistent at times. Moving from the Rangers Ballpark in Arlington to Commerica Park is going to have a negative impact. Commerica hasn't played as a pitcher's park the last couple of seasons but it definitely is more limiting on hitters than the Rangers ballpark. But frankly Laird is a hard player to figure out considering his consistent inconsistency. As long as we're paying for him based on last year's numbers I think he is a good pickup at catcher. If members of your league get excited about him based on the trade then it would be better to pass than to overpay.